There have only been a few ethical metalsmiths that have really caught my eye and fit my style, and Rebecca Mir Grady has to be the favorite! It’s rare to find such beautiful stones and precious metals with as much thoughtfulness as the design itself. I once heard we have enough gold and silver circulating the world, we don’t need to mine for anymore. This is the biggest reason why I like to make sure my jewelry is made from reclaimed materials. Also, as an advocate for sustainability, I believe fashion should last, and what’s more lasting than an heirloom? I love simplicity when it comes to jewelry. I want to be able to wear it everyday and with anything in my closet. It needs to be light, but with enough charm to be noticeable. I find Rebecca Mir Grady does this beautifully. Rings are petite, necklaces aren’t over the top and bracelets are exactly what stacking should look like. This is why I feel minimalists and conscious consumers alike would be instantly drawn to her practical, yet unique, designs. 2. Fair & Eco Materials. Like I mentioned before, when there is plenty gold and silver already circulating, why disturb more land? Rebecca Mir Grady primarily works with recycled silver and recycled 14k gold, and several ethically sourced stones. Stones include beauties like rubies, sapphires, opals & diamonds - you can even find some black diamonds in there! 3. Handmade with Love to be passed down from Generation to Generation. Rebecca has been making jewelry for as long as she can remember - & it shows! 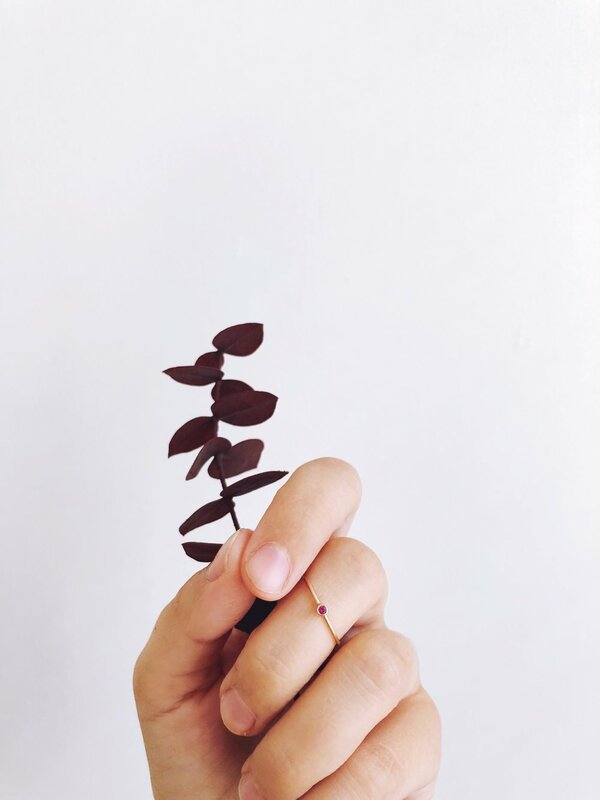 Nothing beats handmade, especially when it comes to jewelry. Heirloom pieces come with so much love and exquisite craftsmanship that future generations will be able to enjoy just as much as you. Now that is what I call sustainable! Keep the fashion circulating and available for more and more people to appreciate. Thetis Ruby Ring: Great for stacking or by itself, the Thetis features a 2mm bezel-set ruby. You can either choose from 14k yellow, white or rose gold band. This is exactly the size & style ring I like to wear everyday. It’s dainty, sophisticated and who doesn’t love the deep red color of a ruby?! Odessa Ruby Necklace: Maybe you remember this necklace from last week or last year even? Also featuring a 2mm ruby, the Odessa is subtle, yet full of character. The carved disk has little markings to give it texture, and the size is just right to catch attention. This style also comes in a smaller disk if you prefer something more dainty. You can find the entire collection online - here - & make sure to stay up-to-date with all the beauties on Instagram. Plus, through the end of August use code SUSTAINABLYCHIC for 20% off your entire purchase!